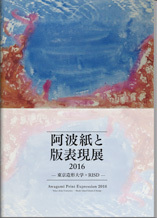 On this occasion, Awagami Factory proudly hosts: “Awagami and Print Expression Exhibition 2016 – Tokyo Zokei University and R.I.S.D”. Our mill has always encouraged artists to explore and push the creative boundaries of washi as an art material. We have placed particular emphasis on developing (and marketing) our washi overseas in the hopes of exploring international creative expressions on washi as well as here at home. Our collaborations with Universities are of particular importance as they introduce washi’s creative potential to young artists who most likely have little experience working with these unique papers. This exhibition features fine art prints made on “Awagami Editioning” washi papers by a group of spirited artists from from Tokyo Zokei University and RISD (Rhode Island School of Design) in the US. The 10 “Awagami Editioning“ papers used are made from traditional washi fibers: Kozo and Gampi along with other (non-wood) fibers such as Bamboo and Cotton. These 10 papers each have unique surfaces and interior structures that allow artists to achieve varied creative expressions within their prints. The papers’ relatively compact / uniform size and high quality makes them both easy to use and to create print editions on – therefore the collections name: “Awagami Editioning”.